In many occasions, you are asked to send some files to your business partners, your associates or other branches. The file that you are going to send is about 50MB. You boss needs it urgently. How are you going to overcome this problem? For server space and bandwidth reasons, many email providers limit the file attachments on a message to not more than 5MB to 10MB is size. For instance, Yahoo and Gmail limit you to send and receive messages up to 10 megabytes (MB) in size. This often makes it difficult to send things like high-resolution photographs, video clips, presentations files, etc. as email attachments. Of course you can burn the files to a CD or save in a USB flash drive and then mail them out. But this is not an ideal option. You might take a few days to deliver the mail to the destination. Sometimes the CD or the USB flash drive might go missing. The other method you can think of is to upload large files or folders to the web server with a file-transfer program and send the intended recipient a user name and password to use for retrieving the files. This method can work for certain people only. In fact there are a few companies offering the service to transfer huge files over the internet. For instance, you can find out more from Pando. 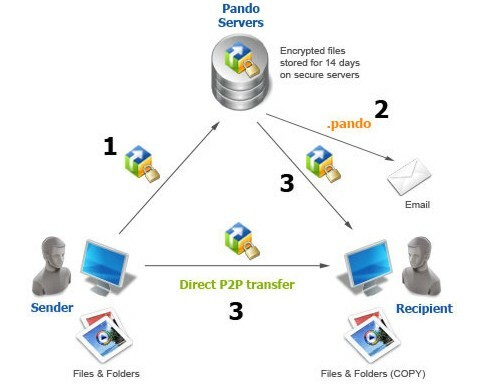 Pando is a free personal peer-to-peer software that allows sending, receiving and publishing large files. It works with both Macintosh and Windows operating systems. You are able to send files up to 1GB in size free through Pando during the trial period. You can use the paid service to continue to send large files from machine to machine. The paid plans start from US$4.95 per month. Another similar service you can consider is Yousendit. You can send files up to 100MB via YouSendit Lite Service for free. You can also subscribe to the paid packages, e.g. US4.99 per month for files up to 2GB. Besides the above mentioned, you can also try the online file storage services such as Xdrive, iBackup or FilesAnywhere. Some of these services are free while some require a fee. By using theses online file storage services, your recipients can actually download the big files that you want to send to them directly from your online storage drive rather than dealing with email attachments.